The King of Swords is the ruler of air; he is a powerful authoritative commander, who makes decisions based on solid logic and intellectual prowess. He is assertive and alert; and a socially conscious monarch, but, if needed he can be aggressive. Because he is ruled by Uranus, he can overturn old ways of thinking and establish new institutions and patterns, that will better serve the needs of his kingdom. 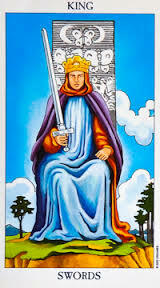 The King of Swords is a man of intellect who can absorb and work with information of all kinds. As a master of reason and logic, he analyzes any problem with ease. He can work out solutions quickly and explain them lucidly to others. In a chaotic situation, he cuts through the confusion and provides the clarity needed to move forward. He is talented with games and other mental challenges. In a tarot reading , this is the man that others seek him out for professional advice, as he speaks with eloquence and insight. He is always truthful and can be relied on to handle any situation fairly and honorably. When a judgment is called for, he can render an impartial but just decision. He lives by the highest ethical standards. He encourages those around him to do the same, and they often live up to his expectations, he is acting from his reason, honesty and high standards. Justice – Arbitration – Professionalism – Impartial decision maker – Politician. A cold lover – Unemotional – More head than heart. Rational and Analytical mind – Objectivity – Strength of Character- Aloof – intelligent – independent.